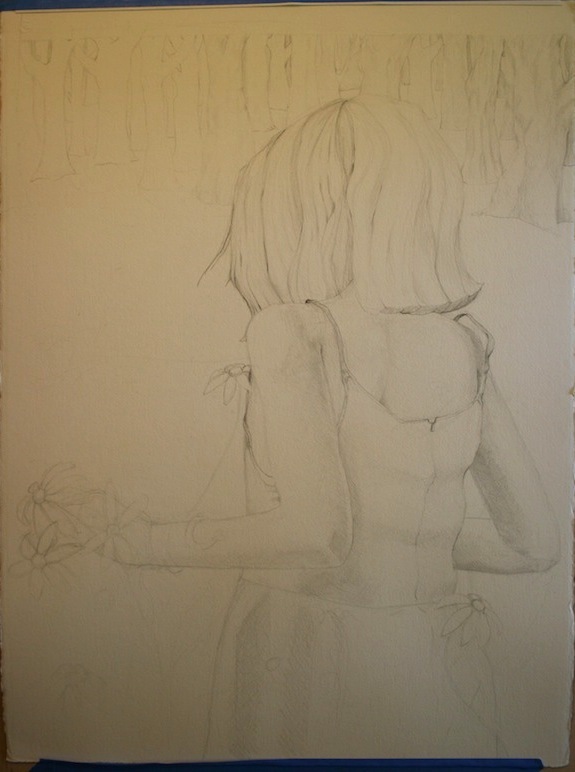 I started this drawing in 2010 and two years later I still feel that it is unfinished. What I still need to do is to push the darks further toward a more darker velvety texture and bring in some additional mid-tones in the face so that it’s not too pale and washed out. From past experience of painting with Tea, I know I need to compare how the tea staining has changed since I first began the piece and then make some corrective decisions so that it won’t look awkward and unintended. The combination of paper, type of tea and possibly even the brew strength and temperature of the tea itself will determine how well the tea holds up over time after application. Some staining will fade away while others lose the warm brilliant undertones that is immediately noticed and become a duller shade of amber. Currently the drawing is sitting in my bedroom behind my dresser waiting for me to return from work. I am sure it would have been finished long time ago if it wasn’t for my job keeping me away from home for months at a time. At the moment there is no permanent title. I know I had a few ideas, I wrote some notes on the back and in a few sketchbooks and random pieces of paper, but still nothing concrete. The idea behind the piece is the loss of youthful innocence and hard kept ideals through harrowing adult experiences and the desperate attempt to hold onto the withering stems of that former identity. I choose to represent the youthful ideals through childlike drawings of flowers, the very same that I myself remember drawing in art class as a young child, their wilting embodies the loss of innocence. 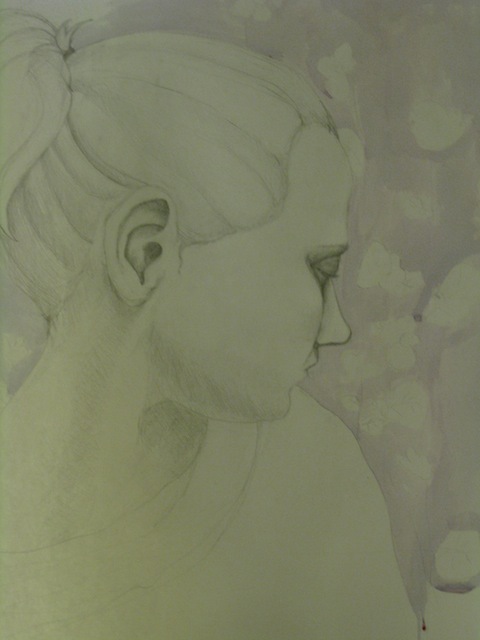 The figure – based on a photograph I took of myself years earlier when I was crying and feeling at my most distraught – will not look at the viewer or at the flowers instead she casts her eyes to the side and downward, feeling alone in her struggles and sense of loss. The colors are muted to reiterate her sense of loss. I left the figure herself black and white. It’s a bit of a preference of mine to appreciate the graphite marks, both subtle and dramatic, in a drawing and not cover them up with another medium. The figure itself is, in my opinion, the best subject to appreciate those drawing qualities that I love so much. Most of my more serious work, the pieces on paper, tends to be strongly autobiographical. Like many other artists I use my own experiences as a well from which I draw inspiration from. This piece in particular reflected an emotional turning point in my life when I felt that I was no longer the same person and could never go back to who I was before. A moment that I am fairly certain every adult has experienced, its apart of life. I think the key is to not lose all of your previous self, to be able to still tap into that piece of you that is still curious and wanting to see the possibilities of what stands before you, but balance our ideals and innocence with experience and wisdom. Materials are Paper from a cheap roll that I bought in NYC, not sure of the makers, Tea bags, Teas, graphite and some graphite washes. 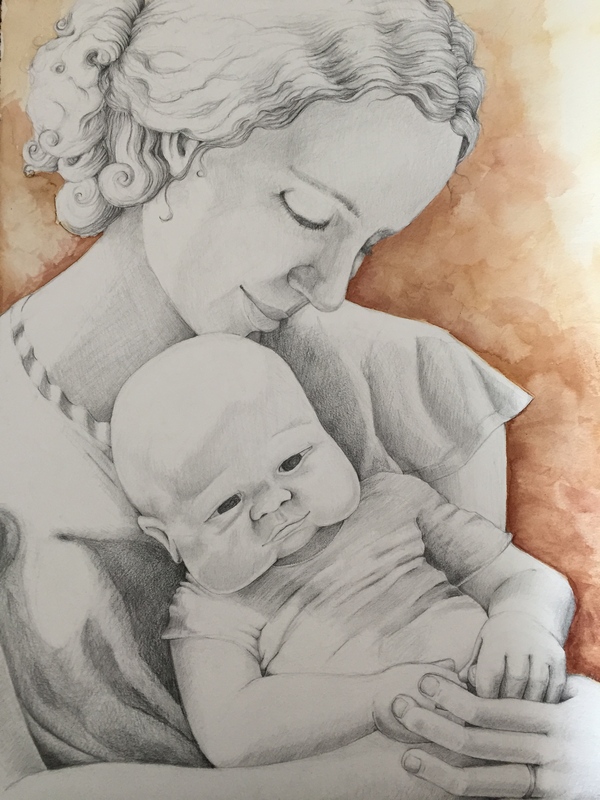 The unfinished portrait of Baby K.
Many years ago a former boyfriend had asked me to draw this for his friend, but when our relationship came to a sudden end I was left with an unfinished portrait of a baby that I never met. 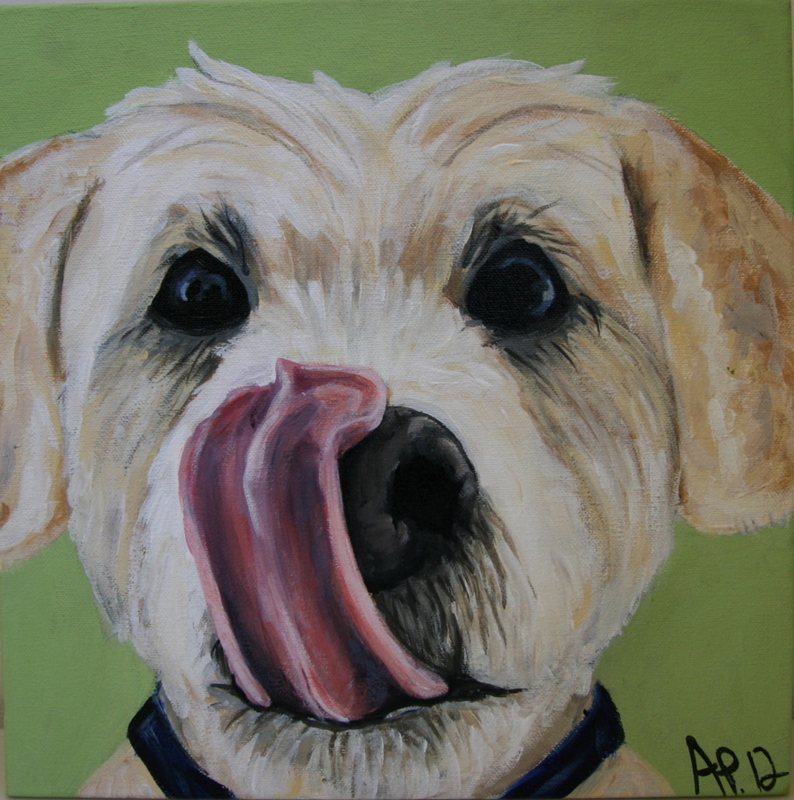 Naturally I had lost interest in completing the portrait and eventually moved my attentions onto other projects. I have, on a few occasions, thought about finishing the piece for the sake of having it finished. But, I have learned that it is best to work on a piece with a consistent “feeling”. I am a very different person now, and my style and artistic eye is not quite the same as it was in 2007. I think at this point the piece would look awkward and unnaturally forced if I were to rework it now. The additional work needed was on the hands and some further definition of the daffodils. The Daffodils was my personal favorite part of this piece. I had this vision of beautiful slender daffodil stems emerging from the tea staining. I wanted to build up a transition between the warm staining and green acrylic washes.